Baby’s Days / Sys IQ Ltd buy all domains similar to my blog. Hi readers, I hope you all had a fab weekend! For those of you that let me know about the issue with not getting emails to say I had updated, I think this has been fixed? Please let me know. We have well over 30,000 visitors now so word is spreading and I just can’t keep up with my facebook inbox, I’m so sorry! Please be brave and comment on the blog, it is all Anon and I remove all email addresses. For those of you that haven’t subscribed, there is a subscribe area on the left hand side of the screen for those on computers. For those on phones, hit the three little lines in the top right and it will pop up with the side bar and you will see where you can subscribe. There is also a problem with the stat counter and I’m manually updating it based on unique views, hopefully it will be working properly by the end of this week. Anyway, on to the first blog post of this week. When I started this blog, many people who were in favour of it were worried I would run out of things to blog about. That was also a worry of mine too, but Baby’s Days just keep giving me more and more material! It’s very helpful! They have a strategy that they use with competitors whereby they buy competitors domain names and then, in a sneaky bid to get more customers, they divert these domains to their own website. I know to many of you this might not make much sense. So let me simplify it. There are two companies, both are hairdressers. One if called Cutz and the other is called Styler. Styler will buy up lots of shops and put signs over the door called Cutzz or Cuts in the hope that unsuspecting people don’t notice. Then in these “fake” salons, they have a secret door to their actual salon called Styler. I’m not sure that makes sense but I hope so! In this example, Bbay’s Days are acting like the salon “Styler”. Very underhand indeed, I’m sure you will agree! Here is a screenshot taken a while ago, this shows that Mark Kahl (The Director of Baby’s Days) owned the domain nobleminder.com. Nobleminder was a company just liked Baby’s Days that provided a software solution to childminders for the EYFS. They dissolved back in May 2012 and a lot of customers lost a lot of data. So either Baby’s Days is/was somehow affiliated with Nobleminder OR they bought Nobleminders dot com domain to essentially lead customers through the secret door to Baby’s Days software. Anyway, the reason I’m going on about this is because my blog domain, www.babysdaysreview.co.uk has many similar alternatives, such as www.babysdaysreview.com or www.babysdaysreviews.com all of which have been purchsed by Sys Iq Ltd. The director of Sys IQ Ltd is Mark Kahl, and Mark Kahl is also the director and creator of Baby’s Days. Why don’t you leave a review for them and see if it gets published? The address is www.babysdaysreviews.com. I’ll personally be contacting everyone that leaves a review on their new domain with a link to this blog so that the can ensure their data is safe. Pop back tomorrow for an update on retrieving my data via the ICO investigation, later in the week I will also be publishing my 4th legal letter. Have Baby’s Days threatened your account previous to this? Yes they have. 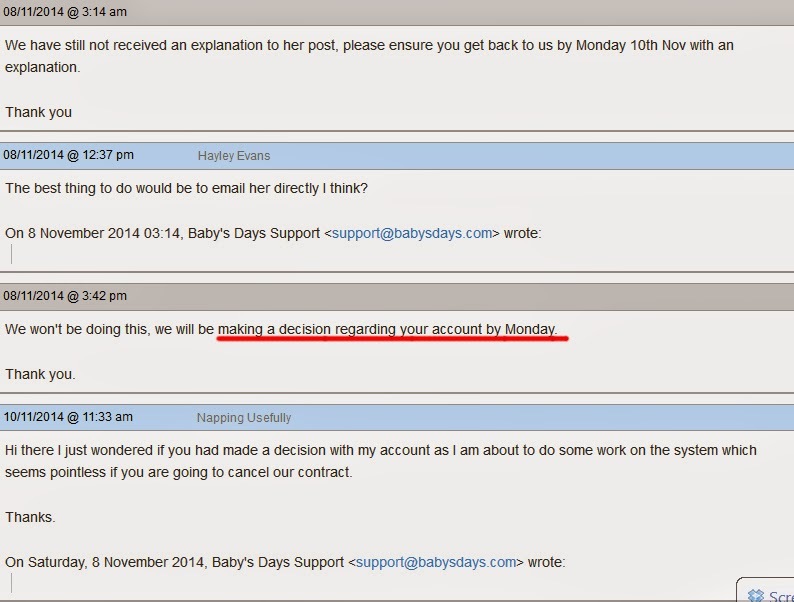 As detailed elsewhere on the blog, I emailed Baby’s Days Support asking if they employed Kel Thomas to run their Official Support Group. This is all detailed on this blog post if you would like to have a quick look. Anyway, because initially Baby’s Days did not give me a clear cut answer regarding this, I asked the same question in a Facebook Group – this was before the new terms and conditions came into force. Within an hour of posting the question on Facebook we received an email from support asking why I felt it necessary to post such questions on Facebook and also asking why I had posted Baby’s Days (vague) reponse on Facebook. So if you are reading this blog and thinking anything like, “this is her own silly fault for starting this blog”. Please, think again. Because I asked the question about Kel Thomas being employed Baby’s Days and posted supports response in a closed Facebook Group. So please, open your eyes to the practices of this company. I am not asking any of you to leave, just be aware of how they operate. Please back up your work, so that when you have an original thought or idea that might conflict with the ‘powers that be’, you will not feel threatened by the loss of your system. It’s just gone midnight now and as I only have time to blog in the evenings I am finding it slow going to get through the messages and blog requests that everyone has sent, I promise I will get back to you all and where I am legally able, I will blog about your concern. I am actually going to post a non requested blog post today concerning Baby’s Days Official Support Group run by Kel Thomas. I don’t rally want to post too much about this group because although they are affiliated with Baby’s Days and do censor posts which is important for others to be ware of, they ultimately were not responsible for Baby’s Days terminating my account for no valid legal reason. Anyway Kel Thomas posted a very long post in her support group, which is grossly exaggerated and innacurate so I wanted to clarify her comment here. Below is a screen shot (that several readers of he blog sent me) of the post Kel made and I have annotated her post post to highlight the inaccuracies. Even though Kel has posted about me in this nature I do not want to make this a personal issue and do not want readers of this blog leaving personal comments about Kel in the comments. Any such comments will not be published I am afraid.